Download "Legislative Council Panel on Security Youth Drug Abuse. This paper briefs Members on the latest youth drug abuse"
1 Legislative Council Panel on Security Youth Drug Abuse LC Paper No. CB(2)167/07-08(01) PURPOSE situation. 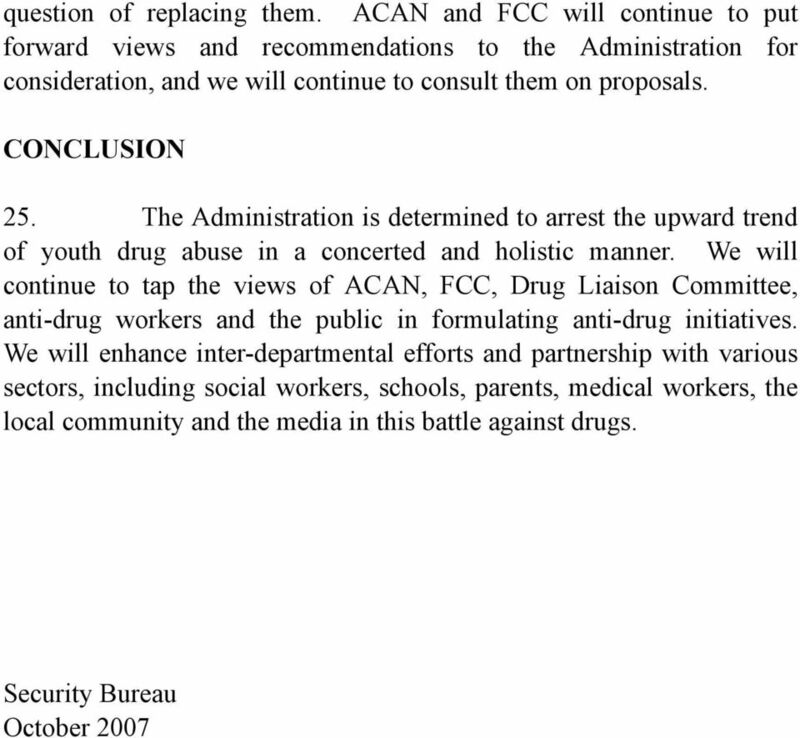 This paper briefs Members on the latest youth drug abuse CURRENT ANTI-DRUG POLICY Formulation of the Policy 2. The current anti-drug policy is embodied in the five-pronged approach - law enforcement and legislation, treatment and rehabilitation, preventive education and publicity, research and external cooperation. It has been drawn up on the advice of the Action Committee Against Narcotics (ACAN) and its sub-committees, with members coming from various fields including youth, social work, medicine, academia and Legislative Council Members. The Fight Crime Committee (FCC) and the District Fight Crime Committees also discuss the youth drug abuse problem from time to time. 3. 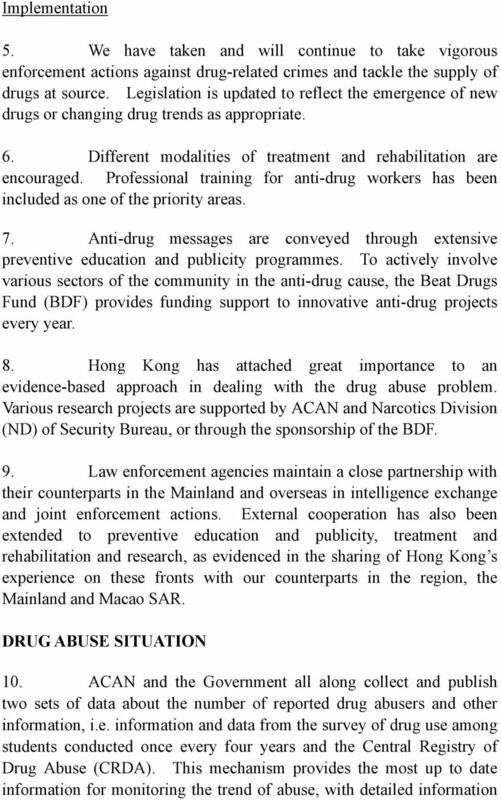 Following extensive consultation with the anti-drug sector (1), we promulgated the Fourth Three-year Plan on Drug Treatment and Rehabilitation Services in Hong Kong ( ) in March 2006, which maps out the strategies of drug treatment and rehabilitation services Hong Kong should take from 2006 to We also keep in touch with anti-drug workers from subvented and non-subvented centres, youth groups, social welfare organisations and drug education experts through the Drug Liaison Committee. (1) A working group led by the Chairman of the Sub-Committee on Treatment and Rehabilitation was set up to develop the Plan. 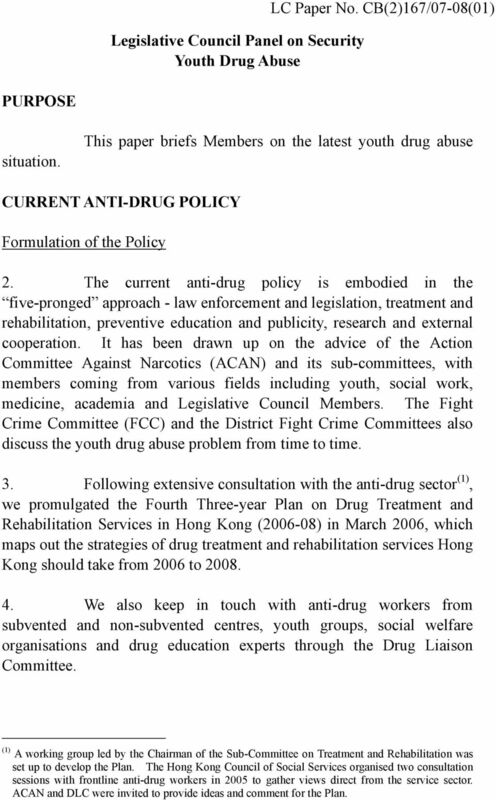 The Hong Kong Council of Social Services organised two consultation sessions with frontline anti-drug workers in 2005 to gather views direct from the service sector. ACAN and DLC were invited to provide ideas and comment for the Plan. 3 about drug abuse among students available every four years. We also make reference to other information or figures, including ad hoc research studies, admission statistics from treatment and rehabilitation service agencies, drug-related arrest and seizure figures, to formulate policy and allocate resources. 11. The table at Annex summarises key data from the CRDA (2). This shows that - (a) (b) (c) Over the past ten years, the total number of reported drug abusers has been decreasing steadily, from in 1997 to in However, the first half of 2007 registered a total of drug abusers, representing a 1.7% increase from that in the first half of 2006 (8 071). During the past ten years the number of reported young drug abusers below the age of 21 fluctuated quite significantly. The number in the past two years reversed the declining trend of 2000 to 2004 and began to rise. 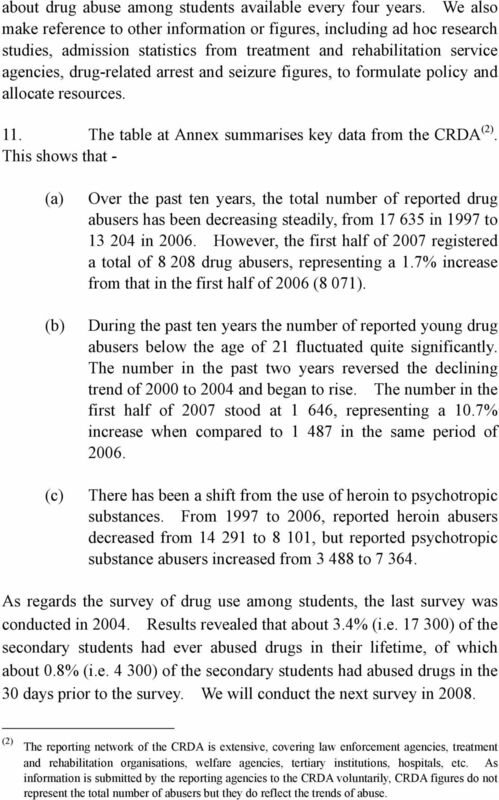 The number in the first half of 2007 stood at 1 646, representing a 10.7% increase when compared to in the same period of There has been a shift from the use of heroin to psychotropic substances. From 1997 to 2006, reported heroin abusers decreased from to 8 101, but reported psychotropic substance abusers increased from to As regards the survey of drug use among students, the last survey was conducted in Results revealed that about 3.4% (i.e ) of the secondary students had ever abused drugs in their lifetime, of which about 0.8% (i.e ) of the secondary students had abused drugs in the 30 days prior to the survey. We will conduct the next survey in (2) The reporting network of the CRDA is extensive, covering law enforcement agencies, treatment and rehabilitation organisations, welfare agencies, tertiary institutions, hospitals, etc. As information is submitted by the reporting agencies to the CRDA voluntarily, CRDA figures do not represent the total number of abusers but they do reflect the trends of abuse. 4 12. The information above reveals that we need to pay special attention to young abusers who are mainly psychotropic substance abusers. LATEST ANTI-DRUG MEASURES 13. One priority is to change the perception of the public, and particularly young people, of psychotropic substances. We have been trying to counter the misconceptions that psychotropic substances are soft drugs, are less addictive, and are less harmful to health than conventional drugs in our publicity efforts, and will continue to do so. 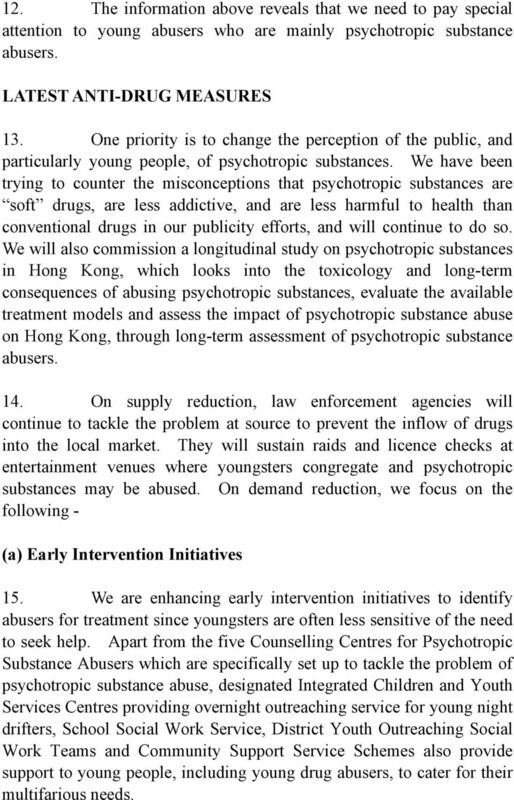 We will also commission a longitudinal study on psychotropic substances in Hong Kong, which looks into the toxicology and long-term consequences of abusing psychotropic substances, evaluate the available treatment models and assess the impact of psychotropic substance abuse on Hong Kong, through long-term assessment of psychotropic substance abusers. 14. On supply reduction, law enforcement agencies will continue to tackle the problem at source to prevent the inflow of drugs into the local market. They will sustain raids and licence checks at entertainment venues where youngsters congregate and psychotropic substances may be abused. 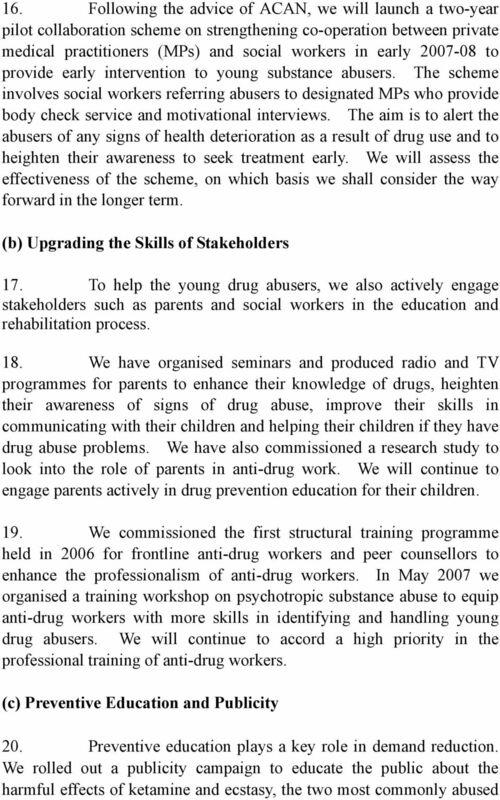 On demand reduction, we focus on the following - (a) Early Intervention Initiatives 15. We are enhancing early intervention initiatives to identify abusers for treatment since youngsters are often less sensitive of the need to seek help. Apart from the five Counselling Centres for Psychotropic Substance Abusers which are specifically set up to tackle the problem of psychotropic substance abuse, designated Integrated Children and Youth Services Centres providing overnight outreaching service for young night drifters, School Social Work Service, District Youth Outreaching Social Work Teams and Community Support Service Schemes also provide support to young people, including young drug abusers, to cater for their multifarious needs. Chapter III. 3.1 Drug abuse is a complex social problem. It can be analysed from many perspectives. Research Report. Transnationalism and Drug Abuse: A Study on Nepalese Drug Abusers in Hong Kong 跨 國 主 義 與 吸 毒 : 香 港 尼 泊 爾 吸 毒 人 士 的 研 究.
St. Catharines School for Girls, K.T.